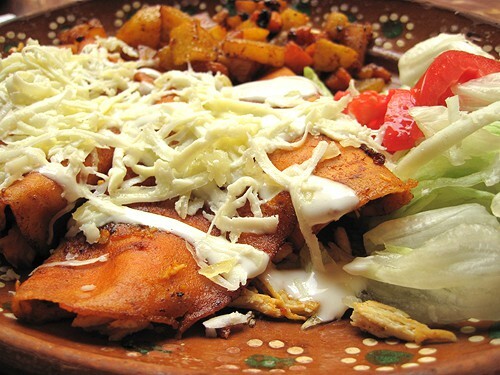 Enchiladas estilo Aguascalientes’n – These enchiladas are filled with chicken and cheese, and the tortilla is bathed in a chile mixture and lightly fried (just enough to make it pliable) before they’re stuffed. Usually, they’re topped with lettuce, diced tomato, cheese and crema Mexicana, and served with a generous side of potatoes and carrots, sort of cooked hash brown-style…. 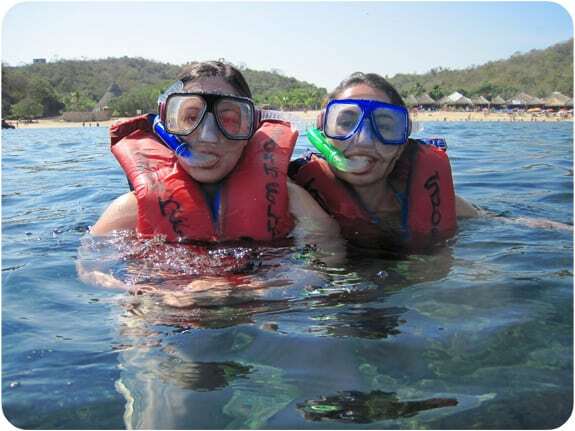 OK, so we’re not spending our Semana Santa in Acapulco–though I wish we were! I could certainly use a trip to the beach after the brutal winter we’ve had this year. Instead, José is in Mexico City for the week visiting his parents and I’m still at home in Chicago. But when I came across this gem a few weeks ago, I knew I wanted to share it at the beginning of Semana Santa. There’s a movie from the early 1980s called “Semana Santa en Acapulco” (also sometimes known as Viacrucis Nacional) starring Lucha Villa, David Reynoso, Luis Manuel Pelayo and Tere Velázquez. It’s about a Chilango family that heads to Acapulco for a Holy Week vacation that turns out to be more than they bargained for. It’s a rude, crude comedy, but I’m sure it will have you muriendo de risa. I just recently saw it for the first time a few months ago thanks to one of the cine Mexicano cable channels we get at home. DVD copies of the film are not very easy to come by, but if you have the patience to watch it on a small screen, I came across the entire film uploaded on YouTube! Have you ever seen this movie? What’s your favorite part? This past weekend, I ventured into a different bakery in Pilsen than usual when I decided to stop for some bolillo rolls to make capirotada for the last week of Lent. 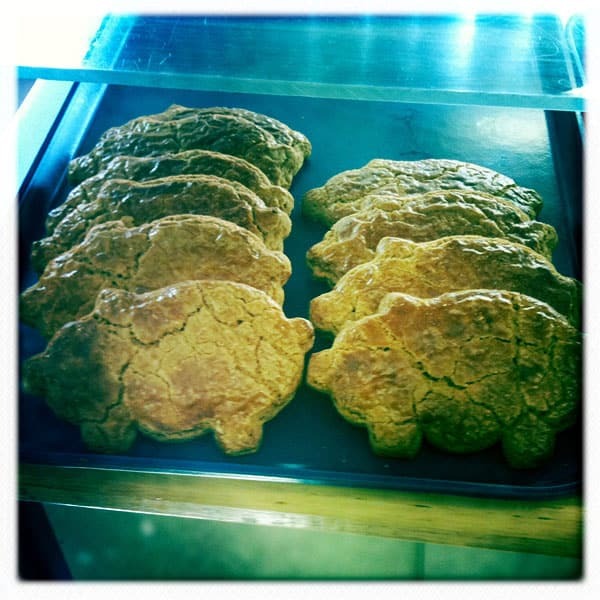 To my delight, this bakery that I hadn’t visited in several years had a tray of puerquitos – a molasses and cinnamon-flavored cookie cut into the shape of a piggy. Some of you know I gave up eating processed sugar for Lent, something that has not been easy in a house where we love desserts and pan dulce. 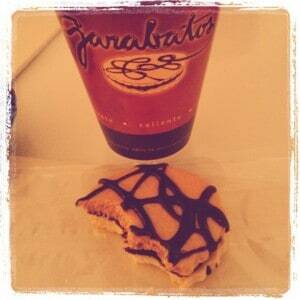 I was too weak to resist the temptation, though, and bought one to satisfy the craving. 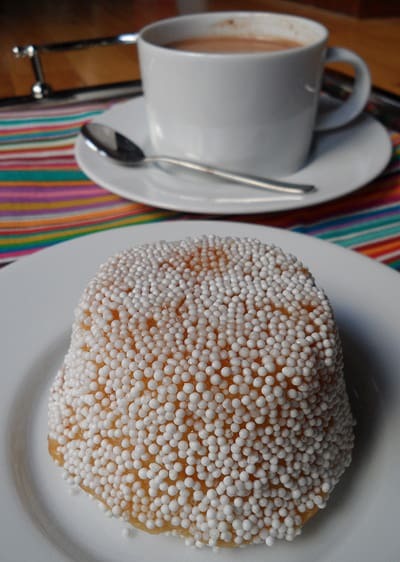 I just needed one little bite and I was immediately reminded of a bakery I visited in Aguascalientes last summer with José’s abuelita Ana. It was adjacent to a charming little restaurant downtown called La Saturnina, a place with cotton candy-pink, purple and cobalt blue painted walls, where she loves to eat breakfast (a place she swears makes the best torrejas in Aguascalientes, in part because of the dark, tangy, molasses-like miel de maguey it’s served with). The bakery, called Panadería Los Angeles, was certainly like a slice of heaven with the scent of sugar, cinnamon and freshly-baked breads wafting through the warm summer air…. It’s no secret that I love Mexican playwright Tanya Saracho’s work. This past weekend I was in the third row of the opening night of her newest show, El Nogalar, playing at the Goodman Theatre through April 24. It was so amazing, I’m going to have to go back to see it again. I cried, I laughed, and at the end I was sad it was over. My only regret about the show is that there is no Act II; despite the 1 hour 40 minute run time with no intermission, I could have watched that story continue to unfold for a few hours longer. 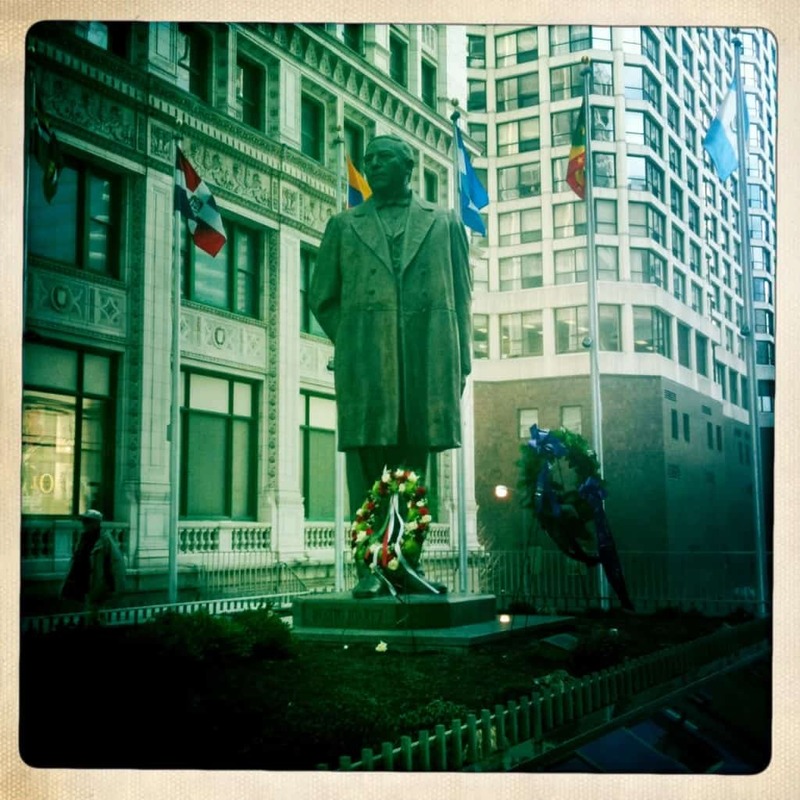 You can listen to Tanya talk about the play in a clip from Chicago Public Radio’s Eight Forty-Eight show from last week. I had the pleasure of interviewing Tanya last year for a feature in Café magazine, in which she was named one of the publication’s 2010 Latino Luminaries – an award for Latino leaders who served as inspiration and for the contributions made in their respective fields and communities. And she’s so brilliant, even the New York Times has taken note. So suffice it to say that I was absolutely thrilled to see a travel piece in the April issue of Chicago magazine about Guanajuato, featuring Tanya as the trusty tour guide. Originally from Los Mochis, Sinaloa, Tanya is a longtime Chicago resident. 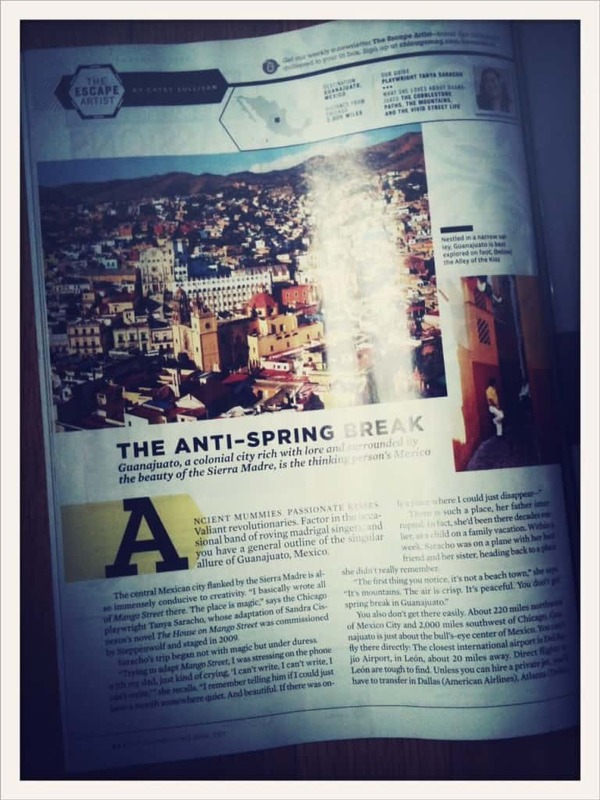 The article touts Guanajuato as “the anti-spring break,” a different alternative to visiting Mexico than just heading to typical places such as Cancún…. I’ve been meaning to write here since Ash Wednesday, which begins the Catholic season of Cuaresma, or Lent. 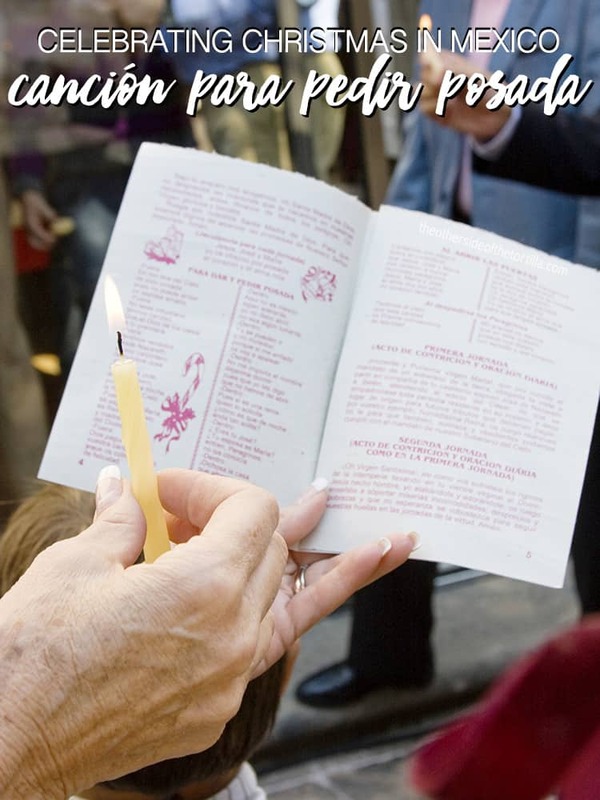 For the non-Catholics visiting who need a primer, Lent lasts for 40 days beginning Ash Wednesday and ending Easter Sunday. And if you’re doing a little math in your head right now and have figured out that there are actually 46 days, here’s why we say Lent is only 40 days: Sundays don’t count according to the church’s calendar. In Mexico, as well as in many other countries, it’s common for Catholics to abstain from eating meat on Ash Wednesday and Fridays throughout Lent, though some observe meatless Fridays year-round. Ash Wednesday and Good Friday are also supposed to be fasting days, during which Catholic adults eat only one full meal. Though, depending on who you ask, you might find some who fast on all Fridays during Lent. You may also be familiar with the practice of Catholics giving things up for Lent – and perhaps you’ve wondered what that’s all about. 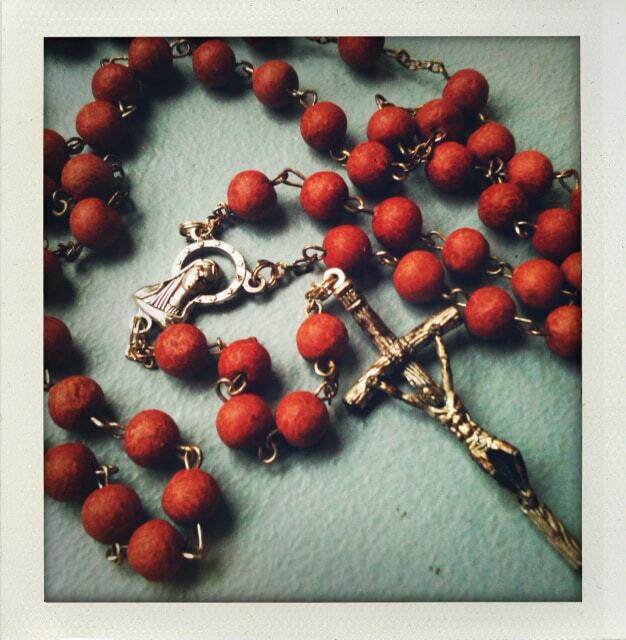 Fasting and giving up vices during Lent are a way for Catholics to connect to Jesus, making a sacrifice that is supposed to help us understand his suffering. Ideally, we aren’t just giving up sin during Lent, but abstaining from sin after Lent as well. For example, giving up your favorite dulces (a particularly popular item for children to give up) but then going back to eating them after Lent is over is not really how it’s supposed to work…. When I dream about carnitas – and yes, I do dream about carnitas – this is the place where I’m always eating. 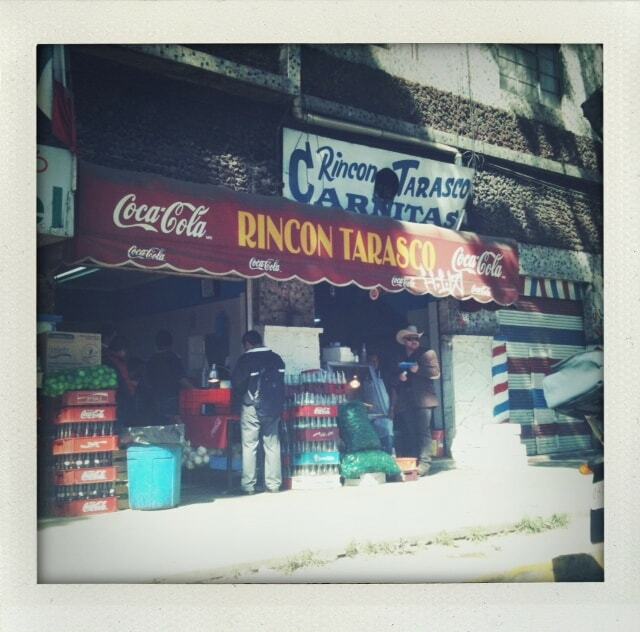 This little hole in the wall has the best carnitas in Mexico City, if not in the entire country, according to José. I’m not about to challenge his ruling (after all, he is the king of carnitas), and though I’ve not eaten them in every state yet, I will say that Rincón Tarasco has the best carnitas I’ve ever eaten in my life. Be sure to get there plenty early, though, or else risk them having nothing left but riñones. They’re only open until they sell out of everything and then they close to prepare for the next day all over again. Those truly dedicated to their carnitas know to show up around 10 a.m. to have the best pick of available meat. They’re closed on Tuesdays. Where is your favorite place in Mexico to eat carnitas? I can’t help but feel a little jealous. This past weekend my suegros and my cuñada took a road trip from Mexico City to visit Abuelita Ana in Aguascalientes. 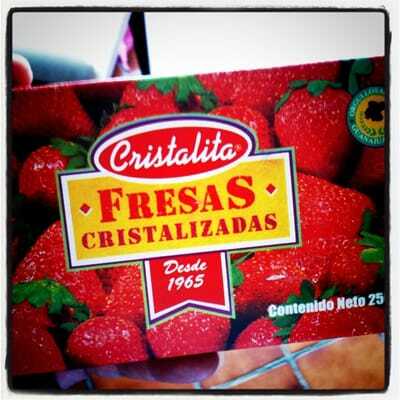 I’m jealous for two reasons: one obviously being that they spent time with abue, whom I absolutely adore, but two, that they stopped for strawberries in Irapuato on the way back to El D.F. yesterday. One of my favorite things from our road trip to Aguascalientes this past summer for abue‘s 90th birthday was the quaint little strawberry stands alongside the carretera in Irapuato. 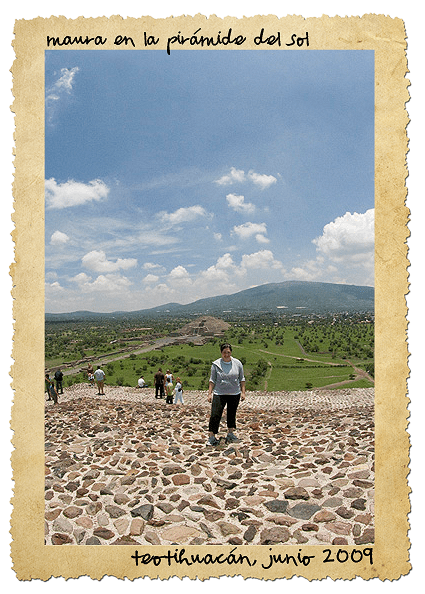 It was my first time road-tripping anywhere more than a a few hours outside of Mexico City, and I absolutely loved being able to see so much of the countryside, passing through towns I had previously only ever read about or heard about in stories from family members…. 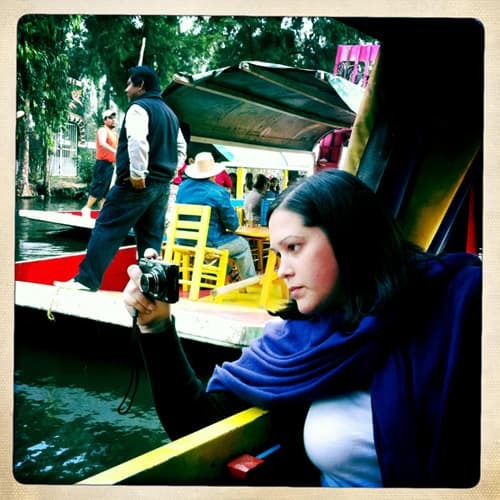 I love this photo that my dear friend, Ana Flores, took of me capturing memories of Xochimilco with my little point and shoot camera on my most recent trip to Mexico City in December 2010. I had so much fun spending the day with Ana and her family while we floated down the canals listening to live mariachi music, eating botanitas, drinking refrescos and enjoying the scenery. I’m working on editing some video footage into a short film to share with you soon about what it’s like to visit these ancient waterways that were once very important to Mexico City’s agricultural transport system. I can’t wait to share it because it brings back such wonderful, warm memories of Mexico City for me. There’s nothing like sharing these cultural traditions with the people you love. Have you been to Xochimilco or are you hoping to go someday? Tell us what you know about it, or what you’d like to know about it! 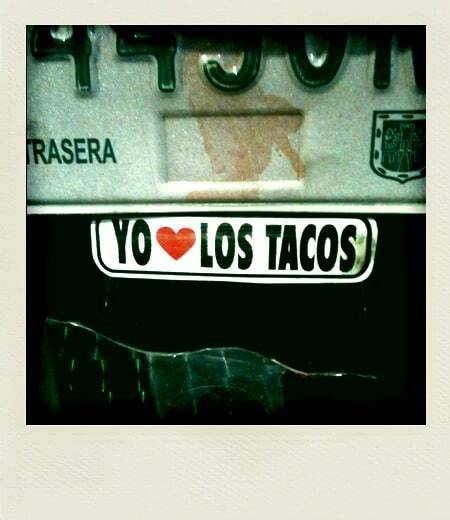 I spotted this bumper sticker on the back of a motorcycle parked at a taquería in Mexico City in December 2010. If you know where I can get one, let me know! I went to the supermercado with my suegra a few days ago and saw these three things next to each other in the produce section. 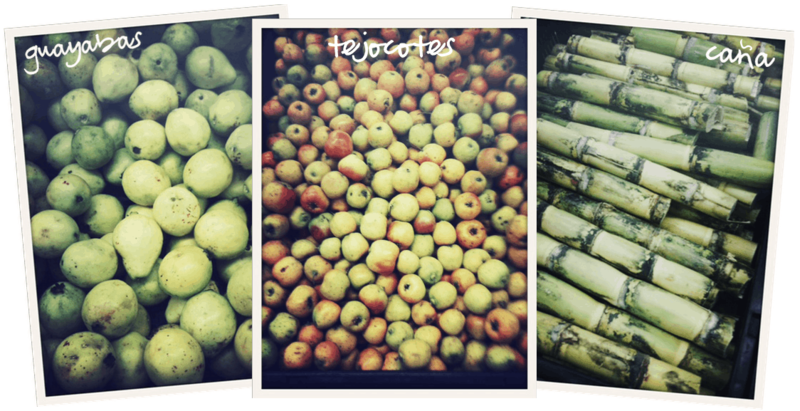 Nothing says La Navidad like guayabas, tejocotes and caña in a little ponche navideño, ¿Verdad? And it’s perfect to keep you warm at any posada. What do you see in the grocery store that makes your mouth water at Christmastime? Mexico City is notorious for its horrible traffic, but especially so right before the holidays. This past Sunday evening, we went out to run a few errands and on the way home we hit a horrible spot of traffic because Avenida Revolución was closed for a big stretch due to a caravana de Coca-Cola, a Christmas parade sponsored by Coca-Cola. The streets were suddenly flooded with parents and children and an incredible quantity of peddlers making cotton candy right on the street. We eventually had to turn around and go miles out of the way to cross Revolución in an area where the parade wasn’t going to reach, so we spent more than an hour in traffic just trying to cross one thoroughfare. And with the traffic here comes the constant variety of horn noises. If you think you’ve heard horn-honking in the U.S., I can assure you what you know is nothing compared to the claxons in Mexico. In fact, there’s even an iPhone app called Claxons Mexico that has 12 different sounds with horn noises very common to Mexico City. To be honest, José and I have only ever heard about half of them, but they’re all pretty funny. When I showed the app to my suegro he was definitely amused with it! 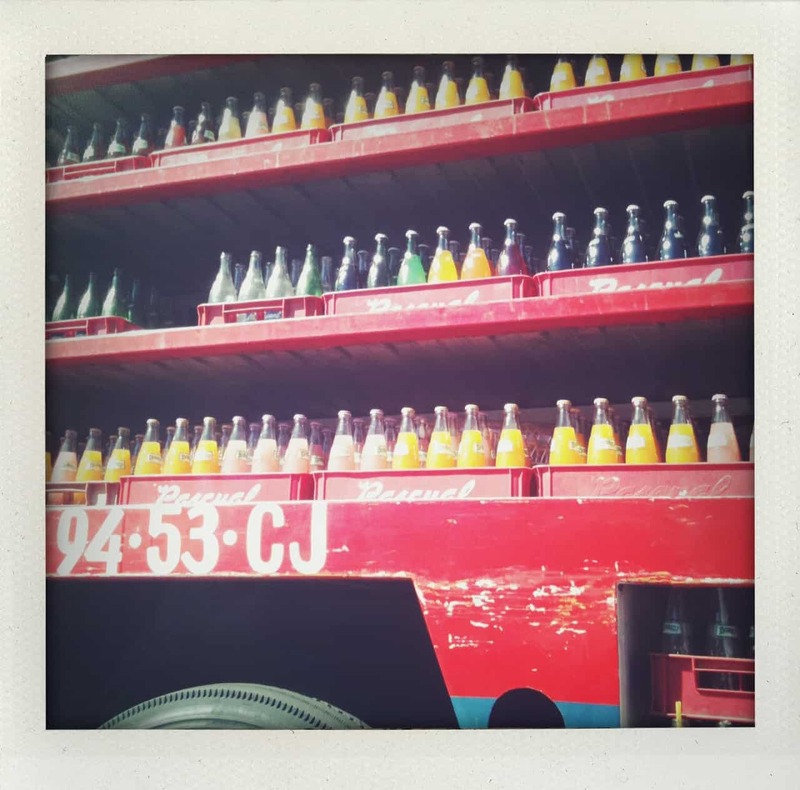 Anyhow, while stuck in traffic last week, I found myself next to a delivery truck full of Boing in glass bottles. It took everything in me to not get out of the car and grab one! You can sort of see at the bottom of the picture that on the lower shelves of the truck were empties with popotes (straws) still in them. 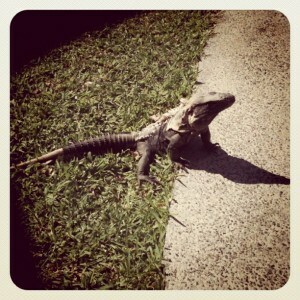 This is one of those photos that I tuck away in my mind as a recuerdito of my times in Mexico. Have you experienced Mexico City traffic? What do you do when stuck in traffic? Las posadas navideñas are the nine days of annual Christmas celebrations that culminate with a big celebration on Nochebuena, or Christmas Eve, in Mexico. The nine days symbolize each of the months that Mary was pregnant, and that’s also why Christmas Eve is more celebrated in Mexico than Christmas Day like in many other countries. The posadas often include traditional foods and drinks, especially things like tamales and ponche navideño. There are many different ways to make ponche, and each family does something different. 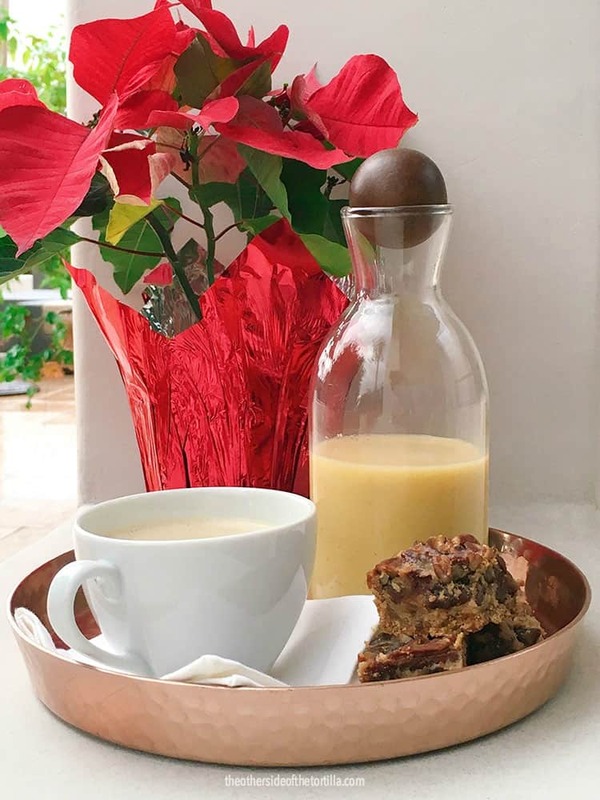 Another holiday favorite of mine is rompope, an eggnog-like drink that comes from the famous nuns of Puebla, located about two hours outside of Mexico City. Watch this video to learn more about las posadas and how our family celebrates. 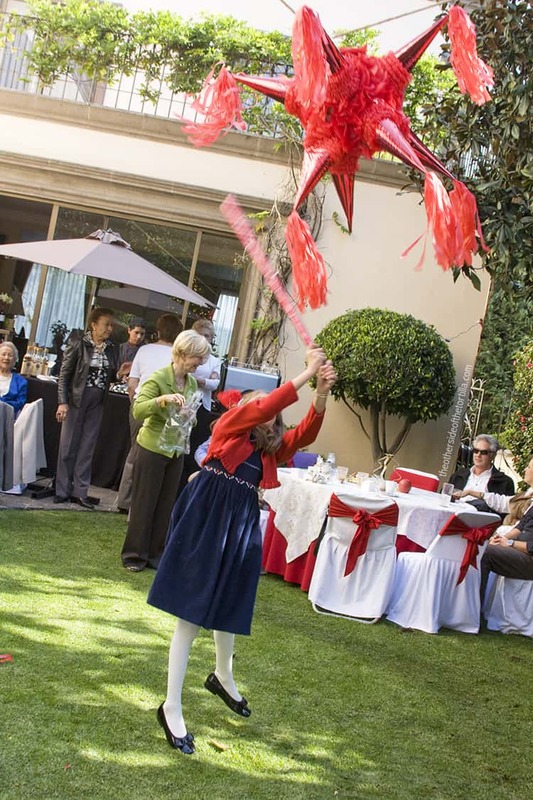 The piñata is also a staple of posadas, and everyone from the youngest to the oldest gets a turn to try to break it. 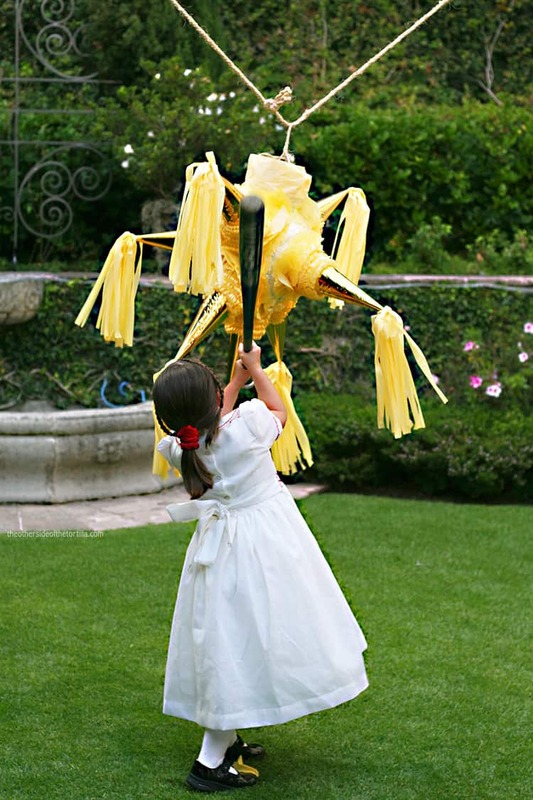 Piñatas are traditionally shaped like a star with seven cones, and the cones represent the seven deadly sins. 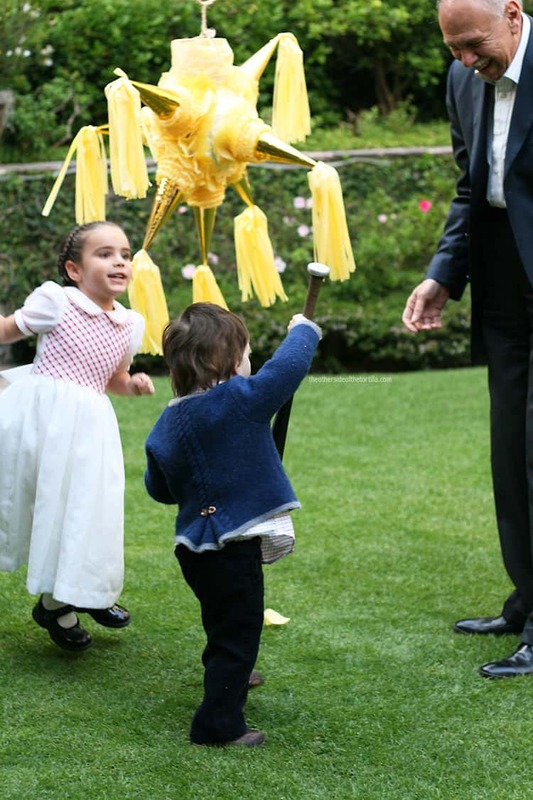 The custom of being blindfolded while hitting the piñata is supposed to symbolize one’s faith, and the stick used to hit the piñata is supposed to symbolize virtue. 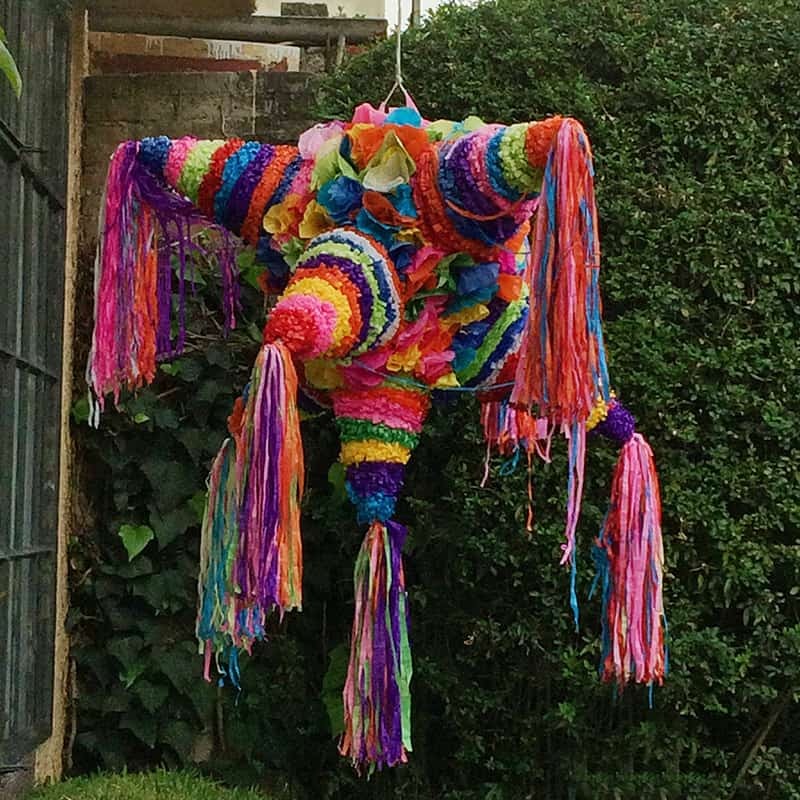 And traditionally, the piñata is made of an olla de barro, or clay pot, covered in paper maché and decorated with colorful tissue paper and streamers. 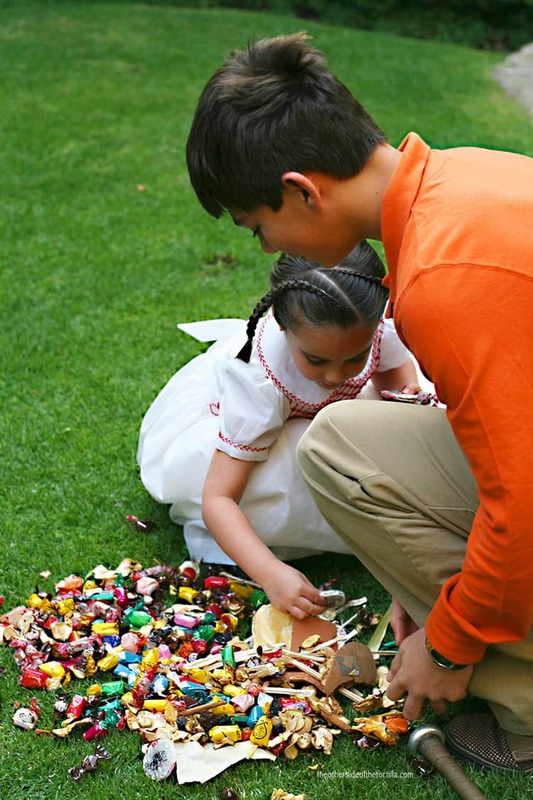 Many people still fill their piñata with fruit such as tejocotes, oranges, and guavas, or cane sugar sticks and nuts but it is also common to fill it with candies such as tamarindo or even modern candies like one of my favorites, a strawberry jelly and marshmallow candy bar covered in chocolate called Bubu Lubu. Below are the lyrics to the piñata song, “Dale, dale dale” as well as the traditional song you can hear in the video when the “peregrinos” are singing. Ya le diste una, ya le diste dos, ya le diste tres, ¡y tu tiempo se acabo! The “peregrinos” sing verse A and the “innkeepers” sing verse B. 1a. En el nombre del cielo os pido posada, pues no puede andar mi esposa amada. 1b. Aqui no es mesón, sigan adelante. Yo no debo abrir, no sea algún tunante. 1a. No seas inhumano, tennos caridad, que el Dios de los cielos te lo premiará. 1b. Ya se pueden ir y no molestar, porque si me enfado os voy a apalear. 2a. Venimos rendidos desde Nazarét, yo soy carpintero de nombre José. 2b. No me importa el nombre, déjenme dormir, pues que yo les digo que no hemos de abrir. 2a. Posada te pido, amado casero, por sólo una noche la Reina del Cielo. 2b. Pues si es una reina quien lo solicita, ¿Cómo es que de noche anda tan solita? 3a. Mi esposa es María, es Reina del Cielo y madre va a ser del Divino Verbo. 3b. ¿Eres tú José? ¿Tú esposa es María? Entren, peregrinos, no los conocía. 3a. Dios pague, señores, nuestra caridad, y que os colme el cielo de felicidad. 3b. ¡Dichosa la casa la casa que alberga este día a la Virgen pura! ¡La hermosa María! Then the peregrinos enter and the tune changes while all sing. Que Jesús, José y María, y María, nos vinieron hoy a honerar. Yesterday for a late breakfast we drove all the way to José’s favorite place for carnitas, only to find that all they had left were maciza (the “white meat” with no fat or bone), hígado (liver) and riñones (kidneys) – which was not exactly what we were hoping to eat. Unfortunately, when you arrive later in the morning, you risk them running out of the best parts. So we turned around and headed back to the car and resolved to show up earlier another day. We hadn’t eaten breakfast in anticipation of eating carnitas, so we were starving. The friend we brought with us recommended another taquería not too far away called El Borrego Viudo, or The Widowed Sheep, which is supposedly one of the best taquerías in Mexico City, especially after a night of drinking. There are only seven items on the menu: al pastor, suadero, longaniza, sesos, lengua, cabeza and tepache (a drink made of fermented pineapple and sugar). 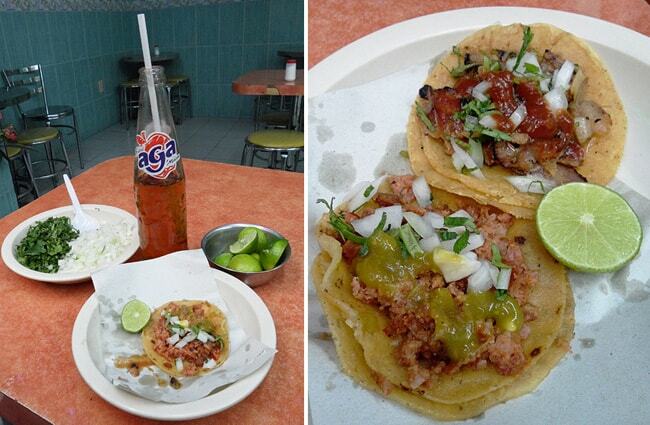 We stuffed our panzas with tacos de suadero, longaniza and al pastor, and drank an apple-flavored soda called Sidral Aga. According to Chilango magazine, it’s the taquería’s red salsa that people love the most but the truth is that José and I didn’t think it was anything phenomenal. What was phenomenal though was the longaniza, which was perfectly spicy and not greasy at all…. Last night I ate dinner at Merendera Las Lupitas, one of our favorite spots to eat in Mexico City. My favorite part was what came at the end of the meal: an atole and coyotas, which are a traditional dessert that originated in Sonora. They’re usually made with masa harina de trigo and stuffed with piloncillo. The coyotas at Las Lupitas are the best I’ve ever had. 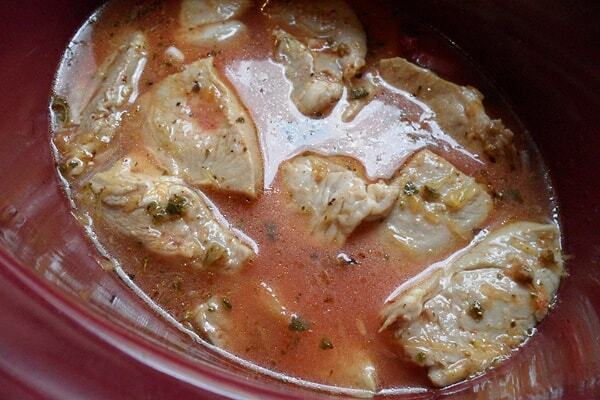 I’ll see if I can’t get my hands on a recipe to share with you soon. For more on atoles, check out my recipe for champurrado, an atole made with chocolate. And if you’re visiting Mexico City, you can find Las Lupitas right off of the Plaza Santa Catarina in the Coyoacán neighborhood. 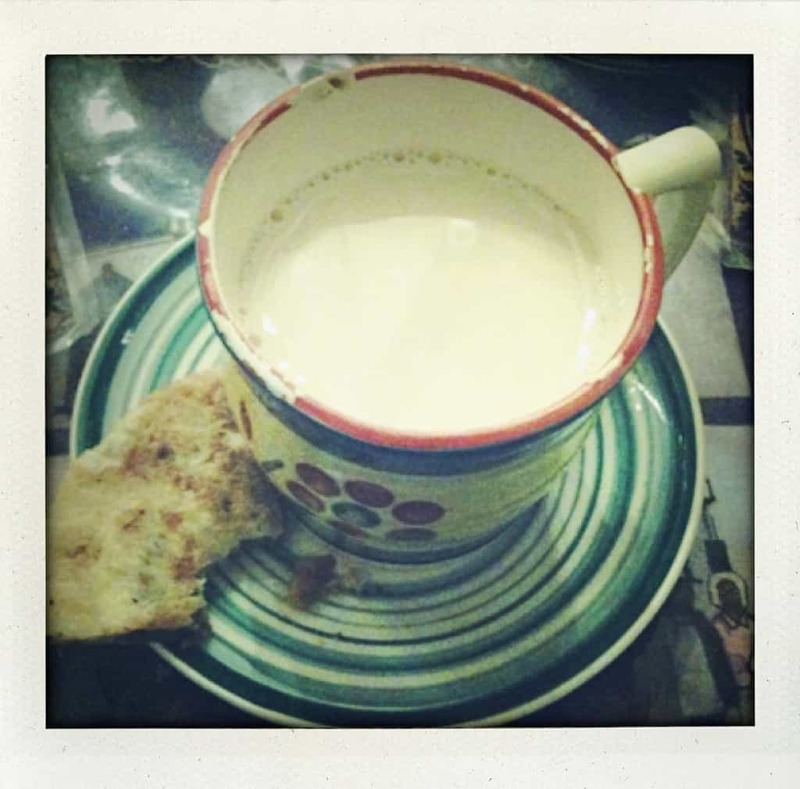 What’s your favorite kind of atole? 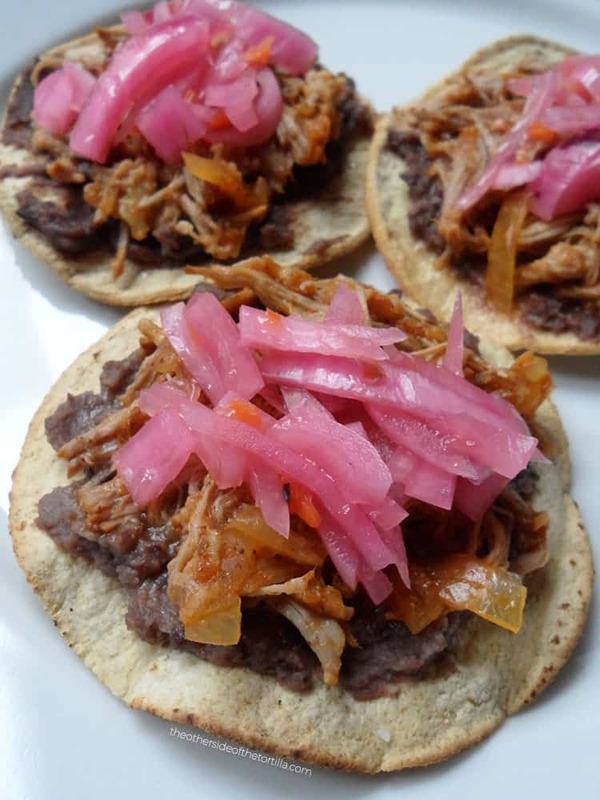 Have you ever had coyotas?